So goes Willie Taggart and "Do Something," heading back to Florida and leaving the Oregon Ducks after one year of very mediocre football. 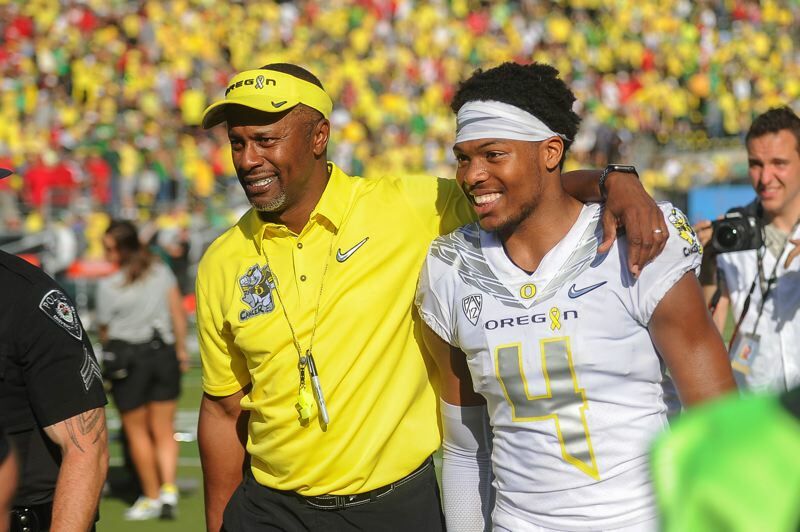 Time will tell, but Florida State might have done Oregon a big favor on Tuesday by hiring Taggart, who seemed to attract much praise for a guy who has a sub-.500 career record. Might they land a better coach? Yeah, the Ducks went 7-5 with Taggart. They benefitted from a November bye that helped them get injured quarterback Justin Herbert back into the lineup and beat Arizona for bowl eligibility in the team's 11th game. Then they pounded one-win Oregon State — both games at Autzen Stadium. But the Ducks also struggled in the second half of many games, being shut out five times after intermission, and they suffered four losses by a combined 151-34. That points directly to coaching, adjustments and the like, including a failure to develop contingency plans should something happen to their prized QB. I had to chuckle as the Florida State drama played out. One would think Taggart was the second coming of Nick Saban, Urban Meyer or David Shaw. There was talk about Taggart being a fantastic recruiter who helped sign recruits that played right away for the Ducks and then landed a top-10 recruiting class. "Land" is relative, as now it's a 2018 class of verbal commitments up in the air because of the coaching change and the Dec. 20-22 signing period fast approaching. And, I could only think, as some people suggested that the Ducks hadn't recruited consistently: Yeah, that's the case in some recent years, but the NFL has a lot of UO players on its rosters, and the Ducks for many years had the reputation of finding gems and developing them. So, Mike Bellotti, Chip Kelly and even Mark Helfrich couldn't recruit? That's revisionist history. Look at their records, their players and their output. Nothing suggests Taggart would have done better than them, consistently. And, I keep reading in an ESPN story that Taggart, despite a 47-50 career record, is considered a young, up-and-coming offensive mind. Really? In what way? Taggart called his offense "lethal simplicity," which translates to me as "calling plays for good players," such as NFL prospect Herbert, all-time leading rusher Royce Freeman and a veteran offensive line that features standout left tackle Tyrell Crosby. The "lethal simplicity" worked against Cal and Utah without Herbert, but it simply didn't work against better teams. Taggart didn't remind me of Kelly in the offensive mind department. All that said, Taggart was a bit of fresh air around the UO program. He did bring energy, injected his team with energy, and I as a media member had a better day after he finished press conferences with, "Have a good day if you want to, I know I will." He came off a nice person, fairly genuine, although it's up for debate now that he's leaving a program after only 12 months on the job. Taggart spoke with enthusiasm — clearly and intelligibly and in complete sentences (unlike his predecessor Helfrich, who spoke in fragmented sentences, seemingly for fear of saying or revealing the wrong things). Taggart basked in the limelight of a 77-point performance against FCS Southern Utah, a couple home wins against Cal and Utah without Herbert, and, after registering maybe the season's best win against Arizona, he took pride in the Ducks putting 69 points on the board against the rival Beavers, who might be one of the five worst teams in the country. Taggart opened practices for 20 minutes to media, which was a nice gesture, but he and minions instituted other media limitations, including making limited player and coach interviews during the season at 8 a.m. (For what it's worth, do the math for a Portland media person wanting to get to Eugene by 8 a.m.). He spread a lot of goodwill, but I always wondered if Taggart showed his true colors when he blamed the media more than once for exaggerating the story about three players ending up in the hospital after early January workouts, which led to the suspension of the strength and conditioning coach. He was a good talker, but when he called it a "bogus" story, I had to look twice at Willie. So, Mario Cristobal, the offensive line coach, will serve as interim coach for the Dec. 16 Las Vegas Bowl while Oregon does a national search for Taggart's replacement. That's good news, as perhaps Cristobal will stay — he's a good O-line coach and co-offensive coordinator and a good recruiter, and he might just be considered to be the next head man. The Ducks will survive even the anticipated loss to Florida State of defensive coordinator Jim Leavitt, and they could thrive next year, no matter what happens with the recruiting class or the first-year players tied to Taggart — might some transfer to Florida State or elsewhere? Herbert and linebacker Troy Dye will be back next year, which is a good place to start, as they are two of the Pac-12's best players. Plenty of others return for the Ducks, enough to be a bowl team next year and perhaps win eight games or more. Think about it, too: Would the Ducks have made a three-game improvement with Helfrich and improved staff? Perhaps. It was a young football team last year, and it was bound to be better with any coach. The 12-month Taggart era will be a blip in UO history. There have been too many accomplishments and too many people invested for the 12-month dalliance with the man to adversely affect the program. Then again, arguably, the Ducks and athletic director Rob Mullens might have picked the wrong guy 12 months ago. Who's to say they won't do the same thing again and that the Ducks won't get stuck in perpetual mediocrity? It should be a destination job. Should be. Taggart is leaving to move back to his home state of Florida and coach one of the country's best programs. That's a good situation for him, and he'll make more money. And, he'll get to live in Florida, where the sun shines and it's warm — and you don't think that played a part in he and his family wanting out of Oregon?